Oh, Eco delivers, definitely. This is the fifth novel of Eco I have read, and I must say, I definitely like his style. His novels are full of information, and absolutely well-researched, and every time I plunge into one, I come out at the other end having plenty of new knowledge to ruminate on. And this book is nothing different. The Island of the Day Before tells the story of a 17th-century Italian nobleman, named Roberto della Griva. We learn that he is alone, the sole survivor of a shipwreck, the Daphne. He believes that the ship is straddling the International Date Line, or the anti-meridian. Needless to say, he cannot swim. But he is absolutely convinced that the only way to survival is to get out of the abandoned ship he is inhabiting and venture through the water to the island that would be within reach, if only he could swim. The narrative is extremely hard to follow for the average reader: Eco requires intellect, and this is not your average airport novel. There are plenty of historical events, plenty of arguments and discussions that this novel touches on. It is a historical novel, so one of the main plots of this novel is the historical search for the accurate method of calculating longitude. There are also discussions and debates about the (non)existence of God, about the afterlife, and about several other theological issues. 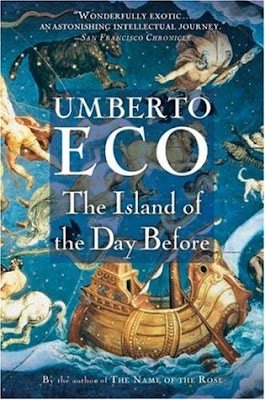 I can see this book as Eco's exposition of his beliefs, set in fiction. So how do you move a narrative forward, when you begin with a setting where there is a single man, who finds himself marooned in the middle of the open sea, in an abandoned ship? There are plenty of flashbacks, and Eco also uses several other tricks to keep the story going. It goes temporally forward and backward, and sometimes, it becomes to determine whether we are still in the story's "reality" or whether we are in Roberto's mind. Eco also uses the doppelgänger effect, blaming his evil twin for all the bad things that happened in his life. Of course, one could also imagine this as a narrative detailing the gradual decay of Roberto's mental state, as he dies a slow death in the middle of nowhere. There, I gave the ending away. But I must say, that finding out the ending isn't the point of reading an Eco novel. Rather, it is a window to Eco's mind, one of the greatest semiotic scholars the world has seen. His novels might be hard to access, but oh they are a treasure trove of knowledge. If you appreciate a well-researched book, then you would appreciate this one. I have to be honest, that there were times in which I myself have felt lost, and no, the narrative isn't gripping when it comes to suspense, but I pushed on, and yes, it was definitely worth it. I give this book 4 out of 5 stars.